The Department of Social Work at Elizabethtown College takes to heart the College's motto, "Educate for Service." From your very first social work class, you are in the field working with people through service learning. The Social Work BSW Program at Elizabethtown College is one of the oldest accredited social work degree programs in Pennsylvania, establishing ourselves in 1977. At Elizabethtown College, we are guided by the motto "Educate for Service." If you are interested in pursuing a career in social work, you are likely already passionate about serving others. Looking for a major where you can work with people? Want a job where you can make a difference? You'll fit right in! In and out of the classroom, you will learn and prepare for your career while helping others. As a social work major at Elizabethtown College, you will graduate with more than 700 hours of field work experience. This far exceeds the CSWE accreditation requirements, which mandates 400 hours of experience. From agencies to local community organizations, you will have opportunity for real-world experience both domestically and abroad. In 2017, 100% of our graduating seniors were accepted to graduate school or employed within one month of leaving E-town! "The program prepared me to smoothly transition into a graduate program and gain employment in the social work field." How Heather's E-town Experience prepared her for success. Heather attributes much of her success to her experiences at Elizabethtown College. Heather served as a peer mentor and peer mentor trainer, a role which she said increased her confidence. “Coming to Elizabethtown College, my peer mentor and peer group were a large part of my first year. After that year, I felt connected to the campus community and that was what I wanted to bring to other incoming students,” she said. As a social worker who specifically deals with pediatric hematology and oncology patients, Heather is working alongside her former field placement supervisor. Her current job not only takes her into hospitals and doctors offices, but also into the community to raise pediatric cancer awareness. “While at Elizabethtown College, completing various service-learning hours taught me the importance of giving back to the community, which, in turn, provided me with multiple educational opportunities,” she said. Heather enjoyed the variety of teaching methods from the diverse faculty and says the small class sizes at E-town allowed for a strong professor-and-student relationship. Rosa Ortiz ('10) was drawn to Elizabethtown College by its reputation of being an outstanding school, as well as hearing from other alumni regarding their positive educational experience. Rosa was an adult learner so she worked full-time at Lancaster County Children and Youth Agency and was a part-time student. The social work curriculum requires that students become active in the community early in their learning career. Rose fulfilled her service learning and internships at Philhaven Mental and Behavioral Health. "I enjoyed that placement because I was able to practice social work theories and perspectives I had learned in the classroom setting. " After graduation, Rosa earned her MSW from Simmons College in Boston. She lives in Sunnyvale, California and is currently working at Asian Americans for Community involvement which focuses on providing behavioral health counseling to the Spanish speaking population. She provides therapy in different types of environments that are most suitable for the client, whether it be at home, office, park or school setting. "I believe Etown has been living up to their motto since it first opened its doors back in the 1800s. Alumni have been able to exercise and put to practice the education they obtained during their time at Etown through acts of service such as: employment, volunteerism, and internships while focusing on on thing: EMPOWERMENT." When asked how Elizabethtown College helped prepare her for the professional world, Rosa explained that the school taught her how to meet people "where they're at," how to provide them with effective resources that will improve their daily level of functioning, and how to empower her clients to achieve a higher level of success by using the strengths perspective. As for Rosa's future career goals, she is doing research into obtaining advanced training in trauma work as well as certification in substance abuse. Alumni Kristie Smith ('07) of Farmington, PA first heard about Elizabethtown College at a college fair, and did an overnight visit. During the visit, Kristie took advantage of the opportunity to sit in on some classes. "The small class sizes and strong relationships between students and professors really appealed to me. More than ten years later, I am still incredibly proud of my decision to attend Etown..."
Kristie was involved in campus life throughout her years at Elizabethtown College, she was a Resident Assistant in Myer Hall. The next year she lived in the LOVE (Laughter Overcomes Virtually Everything) SDLS. In Etown's SDLC program, students are given the opportunity to live in a house that sponsors or supports a certain charity. Students are expected to work with a local agency in order to complete service learning hours. Kristie did not come to Elizabethtown College as a Social Work major; at first she was pre-med. Up until sophomore year, Kristie had never know of all the opportunities a social work degree would provide, but was very glad when she made the switch. 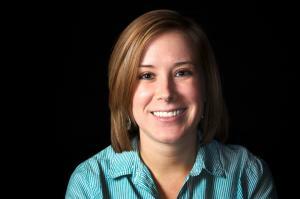 "It's hard to pick just one thing that I loved about Social Work at Elizabethtown. The quality of my education, thanks to Etown's incredible professors, far exceeded my expectations." As part of the internship aspect of the Social Work curriculum, Kristie interned at the CIRCLE (the Coalition for Immigrants Rights at the Community Level) during her junior year. This agency works to protect the rights of immigrants and immigrant families. It provides informational presentations, assistance with filling paperwork, assistance in resolving unfair labor practices and policies, and help immigrants become legal citizens. "Completing my learning at CIRCLE during my junior year was a defining moment for me, both personally and professionally. This experience was the driving force behind my decision to pursue Social Work in the International arena." Kristie studied abroad in fall of her senior year and worked with GARAS (Gloucestershire Action for Refugee and Asylum Seekers) in Gloucester, England while there. This agency offers support to those seeking asylum. While there, Kristie advocated and supported those who needed it. After her return to the U.S. in the spring semester of her senior year, Kristie worked with both the YWCA of Lancaster After School Program and Amnesty International in York, PA.
"The children, families, and staff were absolutely wonderful. The racial and ethnic diversity of students and staff created the perfect atmosphere for cross-cultural learning..."
After graduating from Elizabethtown College, Kristie went on to receive her MSSW at Columbia University in Social Policy and International Social Welfare. While there, she interned with UNICEF in their policy department as well as with Charity:Water. Currently, Kristie is the Director of Public Affairs for the Montana Budget and Policy Center (MBPC) in Helena, Montana. The Montana Budget and Policy Center was created in 2008 to provide in-depth research and analysis on budget, tax, and economic issues. Their mission is to advance sound public policy through timely and objective research and analysis in order to promote shared prosperity and opportunity for all Montanans. "Because we are a small think tank of sorts, I tend to wear a lot of hats. I handle all of our press work, help set our research and policy agendas, and manage our social media accounts. Basically, if it touches on our interface with the public, I take the lead." Kristie also manages a group called the Partnership for Montana's Future. It's a coalition of over forty organizations that does education, outreach and lobbying on state and federal budget and tax policy. The goal is to ensure that all Montanans understand the role that policy, especially budget and tax policy, play in their daily lives. "Whether I'm in the halls of the Capitol or sitting in a room full of community members in rural Montana, I have one goal - educate others on how they can make Montana a better place. The how's and the what's might look a little different, but in the end, we're all in this together." In her personal time, Kristie has started to work on political campaigns. "It's a phenomenal example of everything you learn in undergraduate social work studies - direct engagement, communication, statistics, and policy. You get to help people find their voice and elect the individuals who will work to make their city, state, or country a better place. It's pretty powerful." Kristie is not sure about what the future holds for her. The one thing that she knows is that she always wants to go to work happy and go home knowing that she made a difference, no matter how small that difference is. Heather Teter of Pennsville, New Jersey graduated from Elizabethtown College as a member of the Social Work class of 1992. Elizabethtown College first caught her eye when a brother of one of her friends attended the college. Her visit to campus and Elizabethtown's reputation are what sold her on the college. "When I visited, I fell in love with the campus. It was much more appealing aesthetically then any other campus I visited." Heather very much enjoyed the close-knit feel of Elizabethtown's Social Work Department. She states that many of her social work peers were also her friends which can make classes more dynamic and enjoyable. "... the faculty was also very approachable and supportive of the journey through college." Elizabethtown College works to prepare all of its students for the professional world. The liberal arts aspect of Elizabethtown College was helpful to Heather because it prepared her for job responsibilities beyond the skills specific to Social Work. "With every experience you take away lessons learned. There are certainly many experiences in college, including dorm life, classroom experiences, and experiences in service learning settings. The combination of all of these experiences helped prepare me for what I have encountered thus far in my professional life." Elizabethtown College's Social Work Department is very proud of the field placement component of the curriculum. Students complete internships their junior and senior year. Heather's first internship was at Masonic Homes where she worked with the geriatric population. She then spent a semester at a drug and alcohol detox program located in Harrisburg. For her senior internship of 600 hours, Heather interned at a Catholic Charities Family Based Mental Health Program located in Lebanon, PA. She was then hired by this program upon graduation. "I learned a lot from these experiences, they were each unique, but I took many skills and lessons from each." Heather currently works at the Milton Hershey School as Coordinator of Student Health Services in the Middle Division. She performs many social work rolls including administration in which she oversees all the health services in the middle school. Heather also works in direct practice with students and families. Heather also develops wellness programs for students around issues such as leadership and self-esteem. Heather is also an adjunct professor here at Elizabethtown College. She has been teaching a variety of courses since 2000. Courses she teaches include: Practice II-Working with Groups & Families; Social Problems; Mental Health Issues; and Multicultural Counseling Skills. Elizabethtown's motto "Educate for Service" seems to follow graduates into their professional lives and Heather is an excellent example of this. She works with students who are leaders in the middle school and gives them the opportunity to complete service learning. She organizes a trip for a group of students each summer, during which the students volunteer and spend free time giving back to the community. Heather hopes to pass the idea of giving back on to her students. "It is an amazing experience to work alongside middle school students who are giving back to their communities and to hear about what they learned from these experiences." Kevin Jacoby ('82) is an Elizabethtown local who chose Elizabethtown College after receiving a brochure in the mail. After he visited the campus he fell in love with it. As a student, Kevin embodied the Elizabethtown motto: "Educate for Service" by starting and participating in an on-campus group that was a recycling club called T.R.E.E. ( To Recycle the Earth's Energy). Kevin was a student athlete and played baseball in which he lettered all 4 years, serving as team captain during his senior year. When Kevin looks back on the Social Work Department he remembers his classmates and great instructors, "It was very much a family atmosphere and I believe everyone felt supported." As part of his junior year internship, Kevin was at Masonic Village working with the geriatric population. He also spent some time at Holy Spirit Hospital Pediatrics, where he worked with children and their families dealing with serious illnesses. During his senior year, Kevin worked with the Pennsylvania House of Representatives. Kevin had the opportunity to work with a variety of clients; he was able to engage in micro (individual) practice and macro (community, policy) level practice. "All of these placements provided valuable experience and made the class work much more meaningful." Currently, Kevin is working as an administrator, managing the Case Management Department at Capital BlueCross, a local insurance care company. It is his duty to oversee a team of nurses and social workers. Overall, the goal of this department is to assist people who are experiencing catastrophic medical problems. These problems may include chronic disease or a variety of other difficulties related to their health. Kevin still embodies Elizabethtown College's motto: "Educate for Service" post-graduation, "the opportunity to help people and make a difference in their lives is a precious gift. I have been given many such opportunities as a result of my social work career." When asked how Elizabethtown College helped prepare him for the professional world, Kevin explained how the college allowed him to grow on a personal level. It also gave him the opportunity to prepare for the "real world experiences" that come when a person chooses a career in social work. E-town’s Department of Social Work welcomes Badiah Haffejee as a associate professor. Haffejee studied at University of Denver, earning her master's and doctoral degrees in social work. Before coming to Elizabethtown, she was as an adjunct professor at University of Denver and Colorado State University, Fort Collins. We emphasize international social work and encourage our students to study abroad for a semester or during short-term, service-learning overseas trips led by faculty. About 50% of our class of 2016 went abroad by senior year. As a student in our department, you’ll also be eligible to complete your social work internships abroad, one of the few programs in the country to allow this! We have had students complete placements in locations like India, Mexico, and New Zealand, as well as short-term learning experiences to places like Southeast Asia. Get practical experience right away with social work! In your introductory courses, you will complete 45 hours of service learning. Previous sites vary and include after-school programs, a parenting program in Harrisburg, nursing homes and senior centers. By working with local agencies, our students are able to learn more about the different populations with which they can work as social workers. You'll have a 40 hour internship each semester of your junior year in an area of social work that you are interested in. During this time, you will be introduced to professional social work and these experiences will help you shape your own career goals. During your senior year, you'll select an agency at which you'll complete a 600-hour internship – 200 hours in the fall, 400 in the spring. You will have caseloads and function as a social worker! Sites for both include schools, nursing homes, foster care agencies, correctional facilities, and social services agencies which serve victims of sexual assault or domestic violence. Elizabethtown College social work graduates have high levels of success in graduate school and the job market. The high number of field hours combined with the academic quality of the program make our students shine! Additionally, should you choose to pursue continued education in social work, as an E-town College graduate, you’ll be eligible for Advanced Standing programs, which will allow you to complete your MSW program in less time, typically one year instead of two! If you want a satisfying career serving others, consider choosing one of the oldest accredited social work programs in Pennsylvania.